Plastic routing from Gregstrom Corporation means trimming and cutting your rotomolded and thermoformed parts with speed and precision. Ask Gregstrom how CNC and robotic routing can add value to your next custom-rotomolding or heavy-gauge thermoforming project. Gregstrom Corporation uses five-axis CNC and a six-axis robotic routers to trim, cut, and finish your custom rotomolded parts and heavy-gauge thermoformed parts. CNC and robotic routing remove excess or unwanted materials with precision, and with clean edges that are free of burrs. Tool paths are generated automatically from CAD or CAM files, and variables such as cutter depth, diameter, and number of cuts can be modified on the machine. 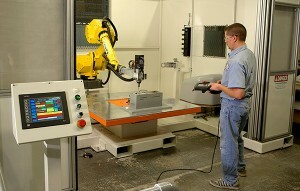 With five-axis CNC cutting and trimming, computer-numerically controlled routers remove unwanted or excess material. By moving the CNC tool tangentially to the part’s surface, multi-axis machining supports smoother finishes and complex designs such as cuts on surfaces with compound radii. With six-axis robotic routing, an industrial robot with a rotating router bit attached with a collet rotates at high speeds along a defined tool path. Depending on your application, the industrial robot can be programmed to cut through the plastic part completely, or to trim excess material from the part. Rapid tool changes on the fly are another benefit of robotic routing. As a full-service custom rotomolder and heavy-gauge thermoformer, Gregstrom Corporation understands the relationship between high-quality cuts and well-made fixtures. Robotic routing cuts thick sheets cleanly, and is suitable for a wide range of materials. Robotic routers can also handle 3D parts that trim presses can’t cut, and can process more parts per hour than CNC equipment. For nearly 70 years, Gregstrom Corporation has been forming and molding plastics at our Made in the USA manufacturing facilities in Massachusetts. To learn how our plastic contract manufacturing services can add value to your application, contact us on-line or call (781) 935-6600.